Dear Tricia, Why do the tops of muffins taste so much better than the rest of the muffin? Oh sweet Jesus... you've really asked a doozy of a question when it comes to food science. And as much as I love demystifying food science into terms that are easy to relate to and might make fun of a celebrity along the way... this one's tough. I'm going to try and make this as simple as possible. 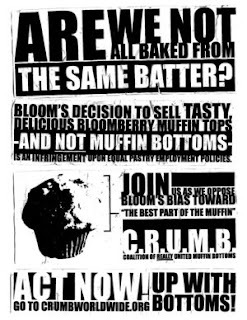 First of all, its true that muffin tops taste better. They're moister and sweeter. When the muffin batter is baked, all of the starches in the batter become politely separated by water molecules. Water is like the hall monitor... or perhaps a crossing guard that keeps everyone in straight lines and makes sure they stay where the heck they need to be. The water stays there in nice straight lines and keeps those starches in straight lines too, separated from the other starches, because that's how the batter rises and stays risen. Unfortunately, once the muffin is baked, the starches like to go hang out with the other starches again, or "retrograde." So as they come together, they squeeze the water molecules up towards the top of the muffin. And guess what sugar is attracted to? Water. So the water gets squished out of the starches and migrates north, along with some of the sugar. In my mind, this makes a sound like when you squeeze air out of the sides of your mouth and it sounds like a fart. I know that's not what really happens, but it makes it a little more magic-like for me. So because water and sugar both hang out up top, that's what makes it moister and sweeter, tasting better than the rest of the muffin. The whole process of this is called "retrogradation." Try not to confuse that with "degradation," or "self-degradation," if you're me at a cocktail party full of couples. Now, once you're telling this muffin top story to impress your friends, throw in some extra fancy terms like "amylose," "amorphous,", and "amylopectin." Don't worry about them knowing what they mean; no one knows that the hell amylopectin is. But if your crazy ex girlfriend Amy shows up and thinks you're making fun of her, then maybe you can "accidentally" confuse the act of "retrogradation" with "degradation." But it wasn't me who suggested that.